It had been far too long since the Shambhala Trust last met in Halifax, and once we had the experience, all of us were asking ourselves why it had been such a long time. We were hosted in the new boardroom of the Sakyong Potrang, next door to the Sakyong’s office, at Sovereign Place. Laurie and Landy Mallery generously offered their home for a Friday evening get together of Trust members and Halifax friends. This was a festive start to a delightful weekend. 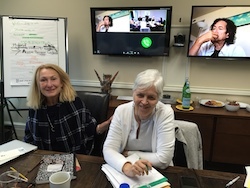 The proponents for all the proposals were able at this meeting to present their project in person, Robert Reichner in Seattle and Holly Gayley in Boulder via Zoom. This technology allowed Greg Lubkin to attend as well as Susan Dreier, John Sennhauser and Cynthia Bradshaw from their homes in Los Angeles, Boston, New York and Seattle. Both Dhi Good (from Boulder) and Ann Shaftel (from the Annapolis Valley) came to the meeting in person as presenters. Saturday’s presentation of the proposals sandwiched two straightforward projects between two that had particular challenges. Dhi Good’s request for support in extending Shambhala Online’s offerings to non-English-speaking countries was well received. The request for $5000 received a small addition of $375 for a total of $5375. For Ann Shaftel’s Manual on Disaster Preparedness for Monasteries (fire, flood, earthquake), we provided $2725 of the $5000 requested. 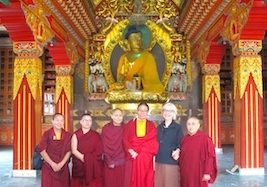 This project is important to the Asian region where Ann works, as it will help save not only the treasures and texts of the monasteries, but the health and even lives of the monks or nuns who at the first sign of disaster race to salvage whatever treasures and texts they can. They are often injured in the process. – London’s request for $520 to cover the costs of advertising their successful Young Sangha events received $425. – Nashville’s request for $800 to assist two of their young sangha members in attending the Youth Leadership Intensive at Karme Choling received $500. – Dechen Choling’s request for $980 to fund the creation of a ‘lasagna’ garden (can be grown anywhere) received $550. – London’s request for $975 to facilitate the provision of cushions for an affordable European dathun in Wales was funded at $675. After working with the ZIG mini-grants, we turned our attention to a proposal for the Awake Business Conference. 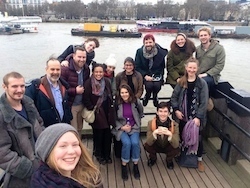 Plans for this event turned out to be still in flux at the time of the meeting, and after some discussion and a time of reflection, the Trust did not go forward with funding this item. 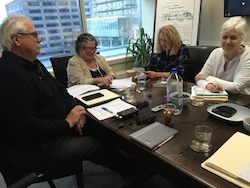 All in all, it was exciting to be in the offices of Shambhala in the Sovereign Building in Halifax for this meeting, and we look forward to being there again soon. Thank you to the Shambhala Trust the four Ziji Innovation Grant projects! The funding is much appreciated to help spread these unique and global manifestations of the vision of Shambhala.